It’s Spring Break for my kids and I’m lamenting that we didn’t plan a trip. Especially since we’ve had one of the coldest Springs that I can remember. It would be so nice to be basking in the sun, being served tropical drinks. Last year at this time we were doing just that in Punta Cana. Instead of that, I’m making lunches for my kids. I get so not used to having them around for lunch during the school year. Lunch is the one meal that I tend to dislike making or planning for. It just seems to be such an interruption to the day. I’m fine with eating a protein bar pretty much every day for lunch. But teenagers? They have their demands. So I whipped up some always unobjectionable Club Sandwiches. And they hit the spot. In a small bowl, whisk together the mayonnaise, mustard, and honey. 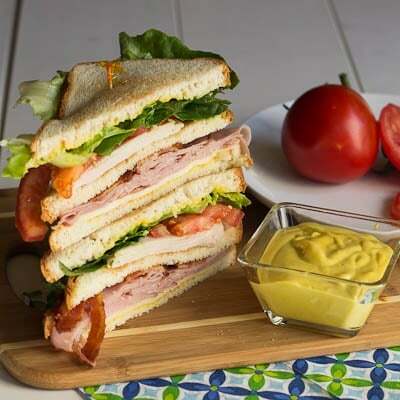 Spread about 1 teaspoon of honey mustard on each piece of bread. 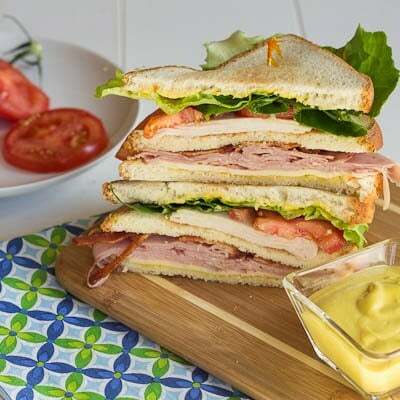 For each sandwich, top one piece of toast with 1 slice of cheese, 3 slices of ham, and s slices of turkey. Place another piece of toast on top. Top second piece of toast with 3 slices bacon, tomato, lettuce, and 1 more cheese slice. Top with last piece of toast and secure in place with wooden picks. 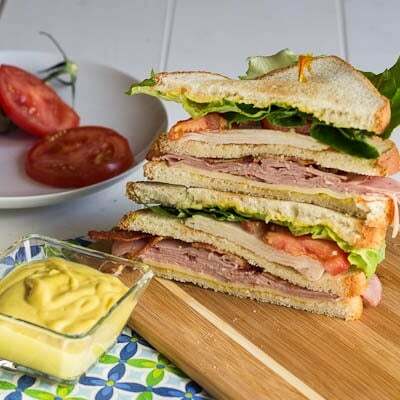 This entry was posted in Sandwiches and Wraps and tagged lunch, sandwich. Bookmark the permalink. That is the tallest sandwich stack I’ve ever seen! Yummm. And I LOVE honey mustard. You should have come down to Phoenix!! It’s already 90* here. Oyyyyyy. Wow! 90 degrees in April is a little much!